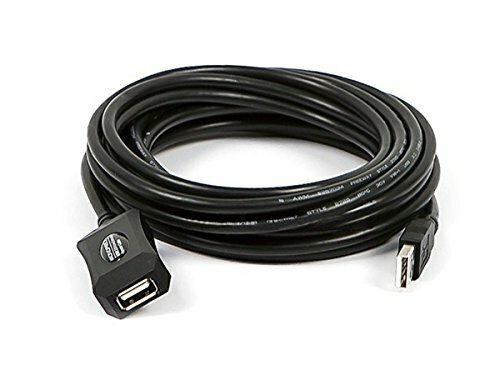 Extend your USB 2.0 connections beyond the normal maximum of 16 feet with this USB 2.0 Active Extension/Repeater Cable from Monoprice! The normal maximum length of USB 2.0 cables is 5 meters or about 16 feet. Beyond this the strength and timing of the signals can get out of tolerance and the USB connection will fail. This extension/repeater cable contains active electronics which recondition and boost the timing signals to ensure that they stay within tolerance. The repeater gets its power from the USB 5VDC bus so no external power adapter is required. Multiple repeater cables can be daisy-chained together to get even longer USB cable runs. This cable is compatible with the USB version of the Xbox 360 Kinect and with the PlayStation 3 Eye camera! Note that this will only work with the USB version of the Kinect for use with the older Xbox 360 systems and that the separate Kinect power cable must be used to power the Kinect sensor. This cable can only extend the data connection for the USB Kinect. Monoprice Lifetime Warranty on ALL Cables: With Monoprice's Lifetime Warranty you can rest assured we stand behind our products and our customers.